The Department of Family & Social Medicine was created at Montefiore Medical Center in 1978, and established as an academic department at the Albert Einstein College of Medicine in 1992. 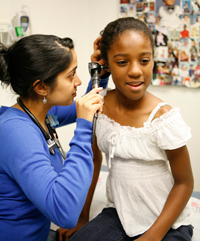 The department has played an important and unique role in the development of clinical care and training in urban family medicine, and been nationally recognized for its efforts. The Residency Program in Social Medicine, which is overseen by the department, has likewise been a model of training and education in the preparation of physicians to work in underserved areas. Our department seeks to combine clinical excellence with a social and community-oriented perspective, with the goal of serving a large and diverse patient population throughout the Bronx. Both Montefiore Medical Center and Albert Einstein College of Medicine have committed significant resources toward the further development of our department, with a special emphasis on the growth of an academic and research agenda. An important priority for us now is to integrate a vigorous research program together with excellent teaching and comprehensive clinical care on many levels. We welcome inquiries and collaboration from all of our colleagues, and look forward to expanding the leadership role of our department both at Montefiore Medical Center and Albert Einstein College of Medicine.